Screen Australia presents in association with Screen NSW, The South Australian Film Corporation and Films Distribution. Produced with the assistance of Screen Territory. Financed in association with Fulcrum Media Finance. A Pork Chop Productiony. 2015. Director: Jeremy Sims. Composer: Ed Kuepper. CD	(ST) Sony Music. 88875138932. 2015. 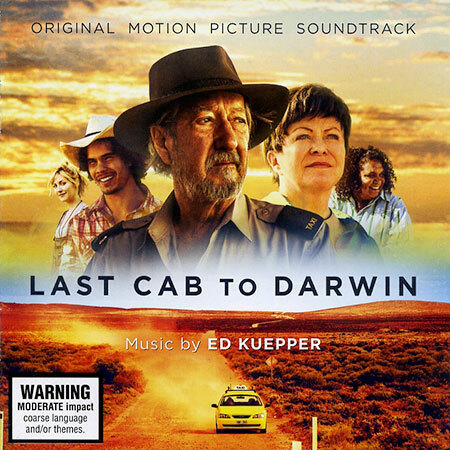 All Music Composed By Ed Kuepper. All Tracks Published By Copyright Control. All Recordings © 2015 Last Cab Holdings Pty Ltd. Musicians: Guitars: Ed Kuepper All Tracks. Bass: Ed Kuepper Tracks 1,2,3,5,7,8,9,10,11,13,14,15. Damian De Boos Smith tracks 6,17. Violins: Veronique Serret Tracks 1,7,8,9,10,11,12. Michelle Young Tracks 1,7,10,11. Cello: Damian De Boos Smith Tracks 1,6,7,8,10,11. Drums: Mick Skelton Tracks 5,10,15,17. Vocals: Ed Kuepper Track 17. Felicity Urqhuart Track 17. Music Produced By Mark Beckhaus. Engineers: Stuart Welch Tracks 1,4,5,6,7,8,9,10,11,12,13,15, 17 Nathaniel Joyce Tracks 2,3,14,16. Recorded At Nylon Studios, Sydney. Last Cab Holdings Pty Ltd, Screen NSW, South Australian Film Corporation, Screen Australia, Cutting Edge Post Pty Ltd, Adgemis Holdings Pty Ltd, Eclipse Films Pty Ltd, Shark Island Productions’ Pty Ltd, Fine Cut Films Pty Ltd, Ned Lander Media Pty Ltd, Mediadag Pty Ltd, Wyelba Pty Ltd, Hydra Hamlet Pty Ltd..
Rex And Polly's Theme. Featuring Michael Caton & Ningali Lawford-Wolf. If Wishes Were Horses. Featuring Michael Caton, Jeremy Cumpston & Chris Stollery. My Name Is Rex. Featuring Michael Caton. No Loose Ends. Featuring Alan Dukes & David Field. My Name's Tilly Featuring Mark Coles Smith & Michael Caton. Feral Cats. Featuring Michael Caton & Mercia Deane-Johns. Oodnadatta. Featuring Michael Caton & Mark Coles Smith. Ghost Gum. Featuring Mark Coles Smith & Michael Caton. Just Drive Old Man. Featuring Mark Coles Smith & Michael Caton. Hard To Kill Yourself. Featuring Michael Caton & Mark Coles Smith. Two Beers Then. Featuring Mark Coles Smith & Emma Hamilton. There It Is. Featuring Ningali Lawford-Wolf & Michael Caton. Darwin Waltz. Featuring Michael Caton & Jacki Weaver. Dog. Featuring Michael Caton & Tom Pauling. The Return. Featuring Michael Caton & Jacki Weaver. It's Our House. Featuring Michael Caton & Ningali Lawford-Wolf. Never Too Late. Featuring Alan Dukes, John Howard & David Field.